I am kind of laughing at myself. Based on the title of this blog today, you are probably thinking that I only touch clay on the days that I write this note. Daily, I was trying to do a warm up exercise with one pound of clay. The last two days have gotten away from me. 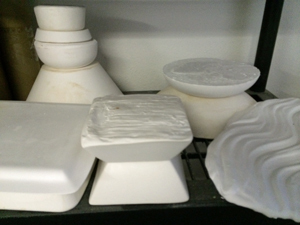 I was making plaster molds, carving, and making other work. So, this is my day 6. Hopefully, tomorrow, I will start my work day with a one pound warm up. Have a fun weekend. Stop into the gallery if you live in West Michigan.